Enjoy the unique golfing experience at Broadland Creek National, Huron's finest and one of South Dakota's best Public Golf Courses. The natural prairie setting utilizing Broadland Creek and some additional lakes afford an opportunity to enjoy nature and golf the way it should be with relaxation, beauty, and excitement. Broadland Creek offers 18-holes of scenic and challenging play. The course has undulating greens, strategically place sand bunkers, and of course, additional lakes on several holes to make the challenge more interesting. With four sets of tees, you choose the level of difficulty you wish to play. 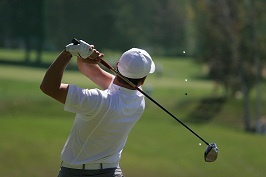 The golf shop offers a full line of golf equipment and accessories. Lessons are available from the PGA Professional Jim Bigelow; rental carts, and rental clubs are also available. The snack bar offers soft drinks, beer, sandwiches, and snacks.